Under the anarchist leadership example of Barack Obama, Democrats across the nation have taken to openly defying any law they disagree with. Obama set the example to follow by his actions. He ordered then Attorney General Eric Holder to stop enforcing the Defense of Marriage Act a year before it was overturned by the Supreme Court. Obama also chose not to enforce federal immigration laws. He also openly defied Congress and the courts on more than one occasion and yet, no one ever tried to hold him legally accountable for his many illegal actions. Political and social disorder due to the absence of government control. Lack of obedience to an authority insubordination. Does this not well define much of the Obama administration? Following in Obama’s footsteps, many state, county and city level Democrats have also taken up his anarchist ways in deliberately defying the federal government and federal laws, especially immigration laws by declaring their jurisdiction to be sanctuary locations for illegal aliens. 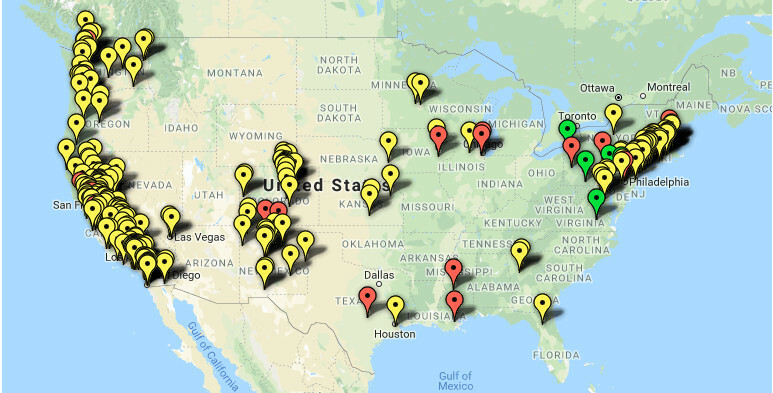 Here is a map from November 2017 of sanctuary cities, counties and states. You can easily identify locations that are controlled by liberal anarchist Democrats. What the map doesn’t show is the 7 states who have declared themselves to be sanctuary states. Those states are California, Colorado, Illinois, Massachusetts, New Mexico, Oregon and Vermont. In California, after state officials declared the entire state to be a sanctuary state, a number of city officials have taken action to make it clear that they are NOT sanctuary locations. Oregon became the first state to declare itself a sanctuary state, but, like some city officials in California, not everyone in Oregon supports the state’s sanctuary status. A campaign was mounted in the state by several groups, including the Federation for American Immigration Reform to collect enough signatures to bring the issue of Oregon being a sanctuary state to voters on this November’s election. Even though groups protecting illegal aliens outspent those pushing to get the initiative on the November ballot by 10-1, still over 110,000 signatures were collected and the initiative will be on the ballot and left up to voters. It will definitely be a ballot issue worth watching. If the voters repeal the sanctuary status, then hopefully, other initiatives will take place in other locations and sanctuary locations will begin to diminish.